Room size: dedicated listening room ca. 4.00 x 5.50m with open extension to a 30 sqm living and open kitchen. Ceiling height is 2.50m, paneled brick walls, tiled concrete floors. 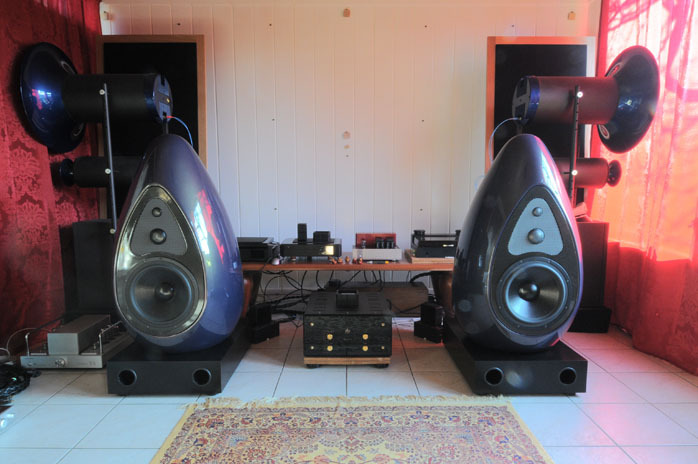 In our December '09 Roadtour Brasschaat feature, we reported on our encounter with the Luxman B-1000f and C-1000f driving Koen Vaessen’s Aquarius speakers. At the time we had focused on the mighty Luxman trio, not so much the loudspeakers. When Koen offered to deliver a pair to our home for a more intimate encounter now, we accepted right away. After all today’s market does not really offer many loudspeakers shaped into partially flattened eggs. Italian U-vola does—what else would they do with that name—and there is Eclipse which begins life as an egg shape for the base of its design. 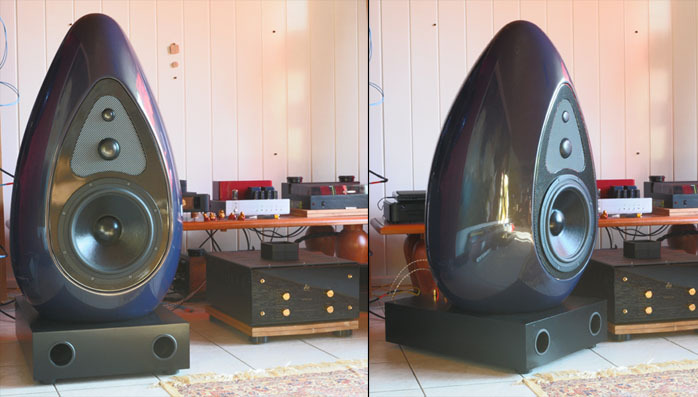 The only speaker we know that flattens the ovoid's face for the baffle is by RTM Smooth. That uses cast iron for the cabinet. And, all of those models are relatively small. On size, the Vaessen Aquarius has 'em all beat hands down. It grows to a meter tall 60cm wide flattened and somewhat pointy egg on a 50 x 65 x 15cm base. The baffle houses three drivers. 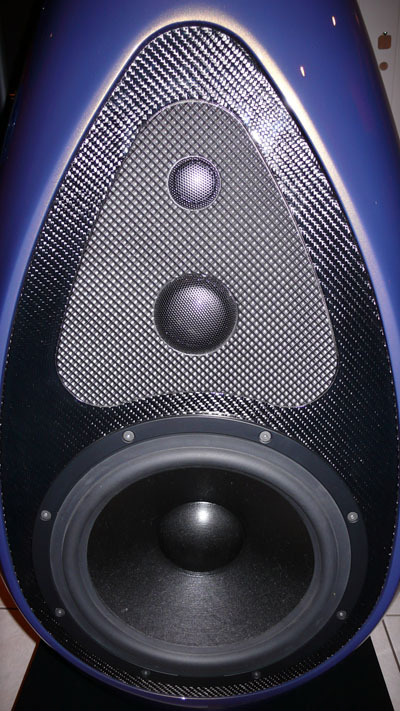 Midrange and tweeter are embedded in a pitted faceplate rimmed with a carbon fiber trim plate. The Aquarius is a vented design with two front-firing ports at the base. 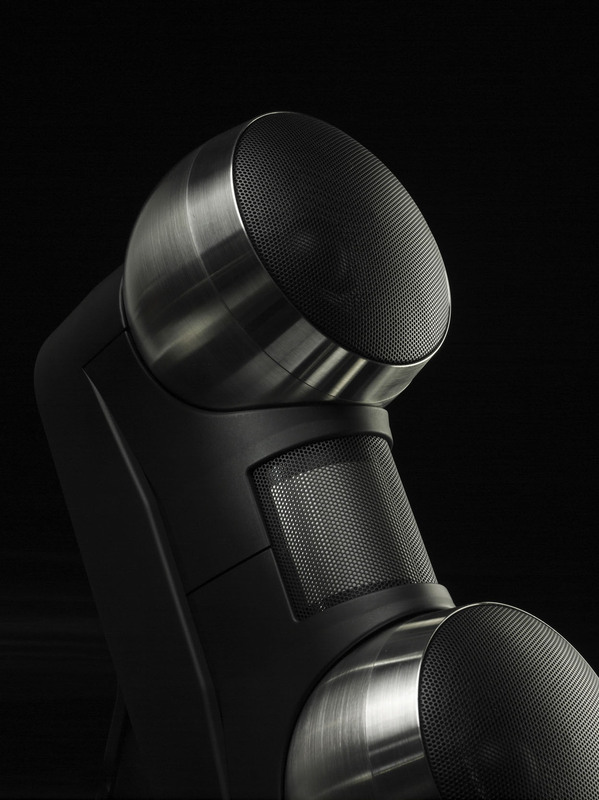 All drivers are of German descent starting with a 30cm woofer at the bottom followed by a 50mm Titanium dome midrange and a 25mm Titanium dome tweeter. That’s right, there are two Titanium domes, both protected by a custom perforated metal cover. If we can speak of a traditional cabinet, this one is laid up of fiberglass skins which are meticulously sanded before being sprayed with automotive water-based paint. Why the ovoid? 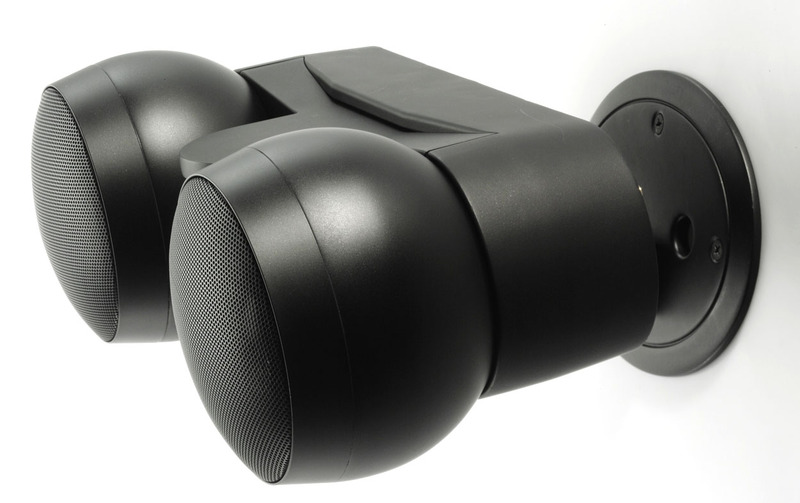 Koen considers a sphere the ideal shape for a speaker cabinet but mounting three drivers to one ain't easy unless the sphere’s diameter were impractically large. Thus Koen elongated his ideal sphere to end up with an egg shape. Being more of a designer than strict engineer, the ovoid aesthetics appealed to him even more. Having a plan is one thing of course, manifesting it quite another. Transforming a 2-D design into a 3-D cabinet involved significant labor. Koen located an artist who worked in polystyrene. He was contracted to create a base mold on which to lay up glass fiber to build the cabinet around. Unfortunately that scheme proved unsuccessful. Next he contacted with a 3-D modeling agency for a more hi-tech attempt. These folks could CNC a full-scale model from massive MDF, then create a polyester mold negative for the glass fiber skin wraps. The trial and error involved ate up considerable funds but eventually led to the desired results which would become the model Aquarius. This was 12 years ago. Since then the Aquarius has undergone a number of updates and refinements. While the cabinet involves a lot of labor to build and finish into the final super-smooth shell, the electronics in the base remain as simple as possible. One top-quality capacitor and inductor each are it. Choosing the same supplier for all three drivers eased Koen's voicing demands. Both titanium units are apparently exceptionally robust to handle very high power with top speed, almost as fast as electrostats. While the Aquarius appears deceptively compact with a high petting factor—every visitor wanted to caress the smooth form—transporting and placing it in a room was a a different kettle of fish. That was due to its wide and deep footprint. Fortunately the weight remained a manageable 60kg and the three Soundcare footers beneath the base made small placement adjustments easy. Two people can maneuver the Aquarius without too much trouble. Upon delivery the speakers were placed somewhat haphazardly at about 1/3rd of the room’s length. By coincidence, this proved no bad start and they ended up only an inch closer to the front wall and slightly farther apart to get the best results. Final setup had them at a 1.65m distance center to center, with our listening position 2.3 meters from the baffle. This wasn't the acclaimed 83% listening distance vs. speaker spacing but worked wonders. During our time with the Aquarius, we were reviewing the LessLoss Blackbody devices. These make a huge difference especially for image details. When recorded with the necessary ambient data, the soundstage gets deeper, wider and taller. To assess the Aquarius pure as it were, we removed all Blackbodies from the room however. Koen promised to follow up his personal speaker delivery with a pair of his own Vaessen loudspeaker cables a few days later. He feels that the Aquarius is quite sensitive to speaker cable choices. Some silver cables have a tendency to turn the sound a little aggressive while certain copper cables will do the opposite and turn it dull. With this in the backs of our minds, we grabbed a number of speaker cable options from our stash. As the Aquarius is a single-wire affair, our bi-wire ASI LiveLines were out. We could have taped off the redundant connectors but didn’t want to risk a short. That left us with runs of Audio Note AN-L, Nanotec Strada #79 nano 3 and Crystal Cable Crystalspeak Reference. We thus ranged from a pure copper Litz type to gold and silver nano particle-doped copper to highly shielded gold-infused silver. Our RoadTour visit had auditioned the Aquarius on a real powerhouse of an amp, the Luxman B-1000f capable of 2KW into two ohms. At eight ohms the Japanese monos output 30 watts in pure class A but provide 250 watts of class A/B headroom. Koen did not specify an exact voltage sensitivity figure for his speaker but assured us that our 6wpc Audio Note Meishu SET would have no trouble driving it. We took his word and connected our amplifier with the budget-friendly blue AN-L cables. After a little warm up we started with Zita Swoon’s A Band in a Box. This is an unplugged live recording of the Belgian band in an empty venue and the recorded mix is loaded with spatial information. Even more important, we love the music with its healthy amalgam of styles to be sometimes danceable, sometimes subdued. With the new combination of speakers and cables, the sound was a little on the soft side and too genteel. Guitars lacked that little sparkle on top. Imaging on the other hand was wonderful and at low volumes the tonal balance was great. Still, that top end lacked the final touch. We tried a little toe-in but had no success. The Aquarius wants to fire straight ahead. A few more CDs confirmed this so it was time for a cable swap. With the Crystal Cables, the Aquarius lived it up but went a little over the top, literally. These twin titanium domes are very fast and the Crystalspeak cables emphasized said trait to end up rather bright while betraying the speaker’s physical location. Neil Young’s atypical LP And the Bluenotes – This note’s for you teams him with a six-piece horn section playing heavy blues rock. At certain times, the speakers clearly popped into the picture. We then tried the Japanese Nanotec wires. 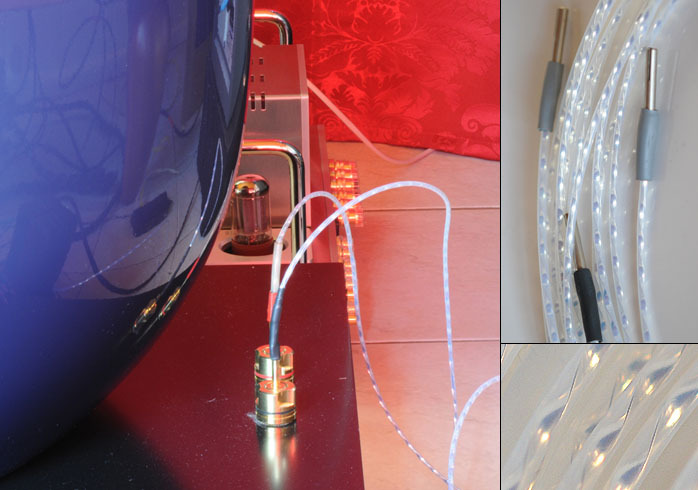 These are unshielded copper cables doped with a silver/gold colloidal film. From our bunch, they were the best compromise. They retained sufficient speed to make the sound attractive and foot-tapping yet lacked any sharp edges. Bass was full and tight and suffered no exaggerated presence.